It will be dry through much of Tuesday night with some clear spells for a time. However, cloud will tend to thicken later, bringing the chance of a few spots of rain by dawn. Turning rather misty. Minimum temperature: 14 to 17C (57 to 63F). Wednesday looks set to be cloudy with just a few spots of rain through much of the day. However, longer spells of generally light rain are expected to arrive later in the day. Children's minister Senator Sam Mezec says Jersey has to press ahead with improvements to child care provision, even if they did not get it right first time. A recent OFSTED report identified several areas for change. Jersey council of ministers has agreed to all of the recommendations made in the report. When we make mistakes in this journey, and we will make mistakes, I think we ought to be brave enough to hold our hands up. Admit when there are mistakes, learn from them and ensure nothing is brushed under the carpet." Jersey Fire and Rescue are currently responding to a fire at Mount Gras D'Eau. They said an area of woodland is alight. Two fire engines are in attendance, and damping down has begun. Tiny transmitters are soon to be used to help tackle Asian hornets in Guernsey. The Bailiff's role as presiding officer in the States Assembly has been "positively challenging" at times, according to Sir William Bailhache, who announced his retirement in 2019. He is due to retire on 12 October 2019. "Like my predecessors, I have tried to be useful in the role as presiding officer in this Assembly, a role which is not always straightforward," he said. "But it has been stimulating and notwithstanding the debate about the role of the Bailiff in the Assembly, I have always appreciated that members have approached that subject without personal rancour." The debate revolves around whether the Bailiff should remain the head of the judiciary and sit in the elected legislative house, the States Assembly. Mr Bailhache was criticised by politicians for wading into the debate by referencing it in his speech as newly elected politicians were sworn in earlier this year. A total of 94 super-rich immigrants have moved to Jersey in the past five years – 22 of them so far in 2018, new figures show. Education in Jersey beyond GCSE level is facing scrutiny by politicians, who say they want to make sure there are enough opportunities for islanders to continue to study. Those wishing to move into further education can currently go to one of four fee paying schools, or the free Hautlieu school and Highlands college. Deputy Rob Ward - who chairs the Education and Home Affairs Scrutiny Panel - says he wants to make sure the government is "meeting the needs" of young people after GCSEs and the changing needs of "local employers". The panel will also compare Jersey to other jurisdictions, Mr Ward said, adding a report would be presented to the States in March 2019. Guernsey's pensioners could receive just over £5 a week more next year, according to the States. Next month politicians will decide on whether to approve an increase to the full rate of old age pension by £5.09 to £217.36 per week. Most benefit rates are proposed to increase by 2.4%, which is the annual rate of inflation (RPIX) for the year to June 2018, according to the Committee for Employment and Social Security's annual report. The President of the Committee, Michelle Le Clerc, said the increase would keep pensions in line with the rising costs of living. Jersey's Bailiff Sir William Bailhache will retire next year, according to the Bailiff's Chambers. Mr Bailhache, 65, took up the office in January 2015. He will retire from office on 12 October 2019 after the move was approved by the Queen. Recreational fishermen catching endangered blue fin tuna in Jersey waters have prompted a warning from the island's government. Anglers Chris Chatfield, Tariq Osman and Joe McKenna have said they spent more than one hour 30 minutes reeling in a 16 stone (103kg) catch recently. The species is estimated to have declined by at least 51% over the past 39 years and has recently been seen around the island's waters. Currently commercial vessels are banned from fishing for blue fin tuna in Jersey, but this restriction does not apply to recreational boats. The UK has a total ban on fishing the endangered species in order to preserve the remaining wild stock, but French fishing crews have been able to target them. A States of Jersey spokeswoman said: "Whilst recreational fishing measures are being considered we remind anglers that this is an endangered species and should not be targeted." The paddling pool in Jersey's Coronation Park has been closed because of leaks, according to the States of Jersey. It was meant to stay open for another three weeks but has been shut early so that work to fix the leaks can get under way. The States says the pool, which was built in the 1930s, will reopen in May 2019. A UK building company is joining a Channel Islands contractor to redevelop Jersey Airport, according to Ports of Jersey. Sir Robert McAlpine and the Garenne Group - who will form a new company, GSRM - were selected by the Ports of Jersey to carry out the work. The companies are also linked with the development of Jersey's hospital project. Ports of Jersey say the project will see a new arrivals facility built, relocation of the airport's fire and rescue service building as well as improvements to the passenger pier. This afternoon will remain dry with further spells of sunshine from time to time, although there will be some cloudier interludes too and breezes. Maximum temperature: 17 to 20C (63 to 68F). There is no evidence of a widespread problem with the standard of Jersey's rented homes, other than a handful of photographs, the Jersey Landlords' Association has said. Chaired by Robert Weston, the association describes a new law which will require landlords to maintain "basic minimum standards" in their properties as "wholly unnecessary" and "terribly vague". The group also warned rents may go up if the law is approved by the States Assembly, so landlords can meet the costs of complying with any new standards. In a letter to Jersey politicians the organisation has called for the final decision on the law to be delayed for further consultation. It says members are being asked to sign off on a law "without knowing what is likely to become illegal and what is likely to become a legal obligation". A vote is expected on the law later by politicians at the first States Assembly sitting of the autumn. A "technical fault" has caused the Post Office in Alderney to offer "limited postage services," Guernsey Post has said. Currently the foreign exchange and MoneyGram - a money transfer system - services are unavailable. A spokesman said the office was still able to take card payments, and hoped to resume a normal service soon. An independent group of footballers from Jersey have had their bid to join a new international association accepted. It means players from the island could end up playing more regular international games. The Parishes of Jersey group was set up by former island footballer James Scott after the Jersey FA's bid for UEFA membership was rejected in February. The goal was joining the Confederation of Independent Football Associations (CONIFA), a collection of football associations which either do not want to be, or have not been accepted to be part of FIFA. The bid - which was run independently from the Jersey Football Association - was accepted on Monday night, and means the Parishes of Jersey team will be eligible to qualify for the organisation's World Cup in 2020. Previous World Cups have featured teams like Tibet, North Cyprus and Tuvalu, leading some to question the quality of the football played by the organisation's members. But this year's tournament, hosted in London, drew sizeable media attention and crowds, prompting some of Jersey's current island footballers to express support for the bid on social media - seeing it as an opportunity for more international games, and more trophies to win. Teams from the UK, Isle of Man, Ireland and France are meeting in Jersey for a two-day workshop on Asian hornets. The invasive species threatens all pollinators - including honey bees - and is established in Spain, France and the Channel Islands. There have also been multiple sightings in the UK, including reports on Tuesday from Liskeard and Hull. Willie Peggie, Jersey's director of natural environment, said the British-Irish Council workshop would allow officers to "share ideas and experiences" on the "detection and control of Asian hornets". Local beekeepers will also speak to the nation's representatives about their fight to track down Asian hornet nests, and how they develop. Mr Peggie said: "As the most southerly jurisdiction, we are the first to be significantly affected by Asian hornets as they move northwards with the changing climate." A school in Guernsey will not ban mobile phones because staff believe students should be taught to "ration" their usage. In France, mobile phones in schools have been banned and in the past education officials in the UK have backed calls for a blanket ban, although some schools already do not allow the devices. At Elizabeth College, an independent all-boys school, the director of digital learning Dave Costen says they have created more "no device zones" to limit student's screen time. We are still looking at how much screen time our students use and we have increased the areas of no device zones. These are areas where the boys are welcome to be but they are not allowed to use their mobiles or their laptops. They are expected to use these areas to socialise and talk." 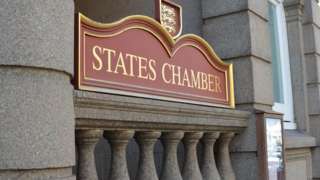 Starting at 09:30 politicians in Jersey will sit for the first autumn meeting of the new States Assembly. A vote is expected on a new housing law which will require landlords to make sure property is of a certain standard. Members will also decide if future civil servants can be given 'entitled' status after it emerged Charlie Parker - the Chief Executive of the States - was given local housing qualifications as part of his contract. You can hear live commentary of the meeting on BBC Radio Jersey.